The PGA TOUR announced Wednesday that FedExCup champion Justin Thomas has been named the 2017 winner of the Jack Nicklaus Award for PGA TOUR Player of the Year, as voted on by the TOUR’s membership for the 2016-17 season. 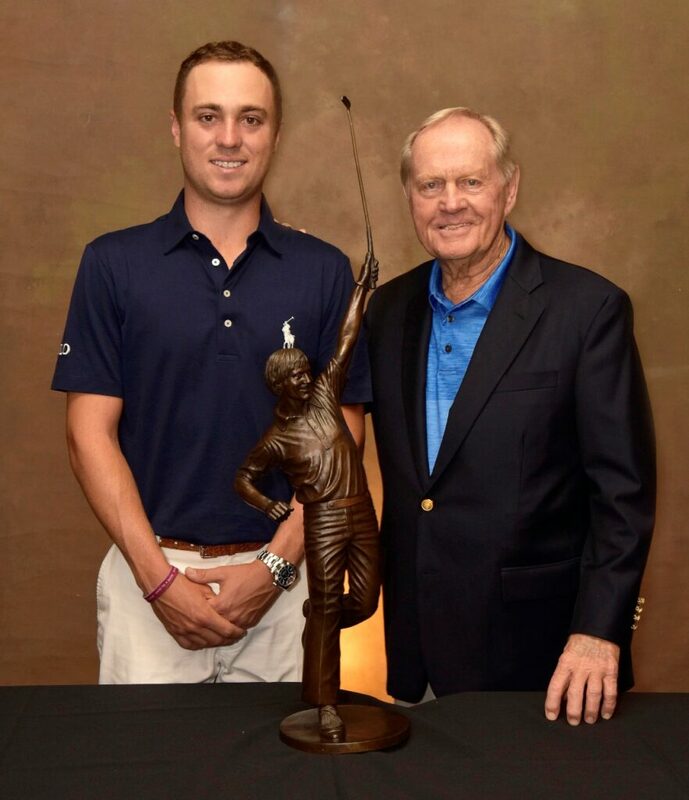 Thomas received his Jack Nicklaus Award on Wednesday, and from the Golden Bear himself. Nicklaus surprised Thomas by interrupting an interview with PGA TOUR Entertainment, which was being held in the library at The Bear’s Club—the Nicklaus family’s home club in Jupiter, Fla. where Thomas, a Jupiter resident, is a member. This is the third straight year a member of The Bear’s Club has received the Jack Nicklaus Award as Player of the Year, following Rory McIlroy (2015) and Dustin Johnson (2016). Thomas, a 24-year-old native of Louisville, Kentucky, attended the University of Alabama, where he was the 2012 Jack Nicklaus Award recipient as the Golf Coaches Association of America (GCAA) Collegiate Player of the Year in Division I. Fast-forward five years, and Thomas captured the 2017 FedExCup, following a five-win season that included his first major championship victory at the PGA Championship. His other victories came at the CIMB Classic in Malaysia (October 2016), the Sentry Tournament of Champions, Sony Open in Hawaii, and Dell Technologies Championship. At the Sony Open, Thomas became the youngest player to shoot 59 on the PGA TOUR, doing so in the first round en route to a wire-to-wire victory. Thomas joined Jack Nicklaus, Tiger Woods and Jordan Spieth as the only players since 1960 to capture five wins, including a major, in a season before the age of 25. Nicklaus maintains an open-door policy with today’s young players. “Justin called me before he went to Augusta and we sat down for a couple of hours (at my home),” Nicklaus said. “He then called me before he went over to the British Open. We’ve talked a little bit here and there about all kinds of things. In 25 starts, Thomas had a TOUR-best 12 top-10 finishes (tied with Spieth) with 19 made cuts. In addition to his five wins, Thomas added four additional top-five finishes, led by a runner-up effort at the TOUR Championship. He also took home the Arnold Palmer Award as the TOUR’s leading money-winner ($9,921,560) and finished third in Adjusted Scoring Average (69.359). Last week in his Presidents Cup debut, Thomas posted a record of 3-1-1 for the victorious U.S. Team at Liberty National Golf Club. Thomas was selected for the honor over finalists Dustin Johnson, Hideki Matsuyama and Jordan Spieth. For photos and videos of Wednesday’s Jack Nicklaus Award presentation, please visit social media platforms for Jack Nicklaus—facebook.com/jacknicklaus; @jacknicklaus on Twitter; and @jacknicklaus on Instagram where you can watch Jack’s Story for behind-the-scenes footage of the award presentation over the next day.